Last week took place SAGSE Latam 2016 in Buenos Aires and as you knew, Sirplay’s team was there. In these days, the show proved itself one of the most important exhibitions in the betting and gaming industry, in the region. This article wants to take stock of the fair with some statistics and Sirplay’s report. A three-days show dedicated to the gaming and entertainment field combining the industry, the operators and state bodies for a complete sector scene. 6225 participants with an average of 428 people per hour, of which the 75% were Argentinian and the rest from all over the region and even from oversea, as Europe and China. Casinos, bingo, lottery, i-gaming, maker, amusement, marketing, distributor, hotels, security, design, tourism, press, horse racing, cruise, these were all the activities covered by the exhibition. SAGSE allowed a valuable network with the industry leaders and experts through technical courses and interactive meetings. A graphic by Sirplay extrapolated from the official statistics. Beyond the expected success, this 24th edition made it clear that something in the industry is moving. This year there was a particular increase in the demand for online platforms by physical casinos. Finally, they are beginning to understand the importance in providing continuity to their clients. 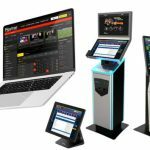 Sirplay’s booth – the number 311a – incited a big interest among the participants, both for its sportsbook platforms and the latest release SAM 3.0. Sirplay’s catalogue is always increasing and its new device merging an Android smartphone with a POS terminal, was one of the most valued at the stand. The extremely intuitive technology excited curiosity for its manoeuvrability and the capability to create infinite cashiers without the need of a land-based office. The networking made at the show has given the company the proof that being near clients’ needs is always the best choice. Sirplay’s team would like to take the chance to thank the people who came from all over the region – in particular, our clients from Paraguay, Uruguay, Brazil and Peru – who decided to stop by and/or gave us the opportunity to show them our potential. Another special thanks goes to the partner Loteria de San Luìs, with whom Sirplay shared the stand and the Jugadon.com project, the most important one in Argentina.